Bill Gates is not only the richest bloke and most generous philanthropist on the face of this planet. He is also the richest bloke and most generous philanthropist on the face of this planet who somehow finds immense amounts of time to pore through books. You'd think that if one's a billionaire, he'd be spending his time sipping coconuts on a beach or hunting wild beasts on the Russian tundra. But not Mr. Gates. The man's a reader. And he suggests that you read as well. In a recent post on his blog, Gates selected six books that you should add to your reading list this summer. A quick look into the titles and authors of the books won't extract surprise from people who are familiar with Gates's works outside of Microsoft. For instance, On Immunity: An Inoculation by Eula Biss is very fitting for the simple fact that Gates and his wife Melinda have made it their mission to make vaccinations available to as many children as possible. And then there's The Magic of Reality by the evolutionary biologist Richard Dawkins. This book is a care-free tribute to the many wonders of science. Dawkins is a gifted wordsmith and he has this uncanny ability to stir excitement out of otherwise dull scientific topics. Published in 2011, The Magic of Reality is among the latest in Dawkins's trail of published books. If you are not too familiar with Dawkins's works, this book would make for a great introduction. Aside from their immense love for science, many believe that Dawkins and Gates also share the same views on religion. Dawkins is an atheist. In fact, his book The God Delusion is one of the most important tomes criticizing the workings of religion. For his part, Gates has never come out as an atheist but he often creates the impression that he doesn't subscribe to any deity. That makes him either an atheist or an agnostic. Gates's concern about the environment and food security is mirrored in his recommendation of Vaclav Smil's Should We Eat Meat: Evolution and Consequences of Modern Carnivory. 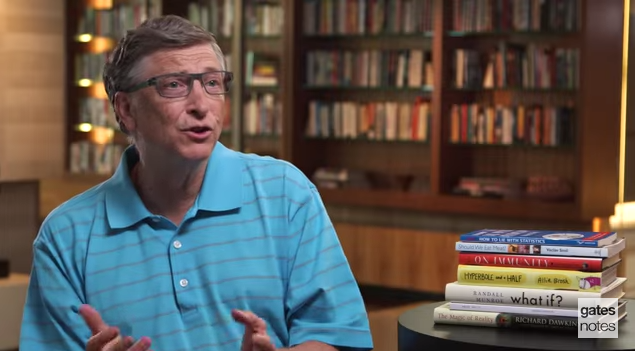 Gates's review of the book has taken a lot of negative criticisms and these criticisms have a solid foundation. Gates was sometimes way off on the topic. A comment left on the review encapsulated what's wrong with Gates's view. It said, "I'm surprised Gates, for all his work in this field, has failed to recognize that we're burning up more food growing cattle and farming animals, than if we were to just eat the plant resources we use to feed the animals. It's mathematically crazy that, during a mass shortage of food in some parts of the world, we're feeding a net loss of food in order to eat animal produce." Makes sense, does it not? Criticisms aside, Should We Eat Meat is an eye-opener of sort. It will not cause you to get the whole picture but it will surely fast-track your journey towards it. It makes for a great reference material as well. Two of the books on the list are by webcomic artists - Randall Munroe of xkcd fame and Allie Brosh. Hyperbole and a Half is based on Brosh's webcomic of the same name. The webcomic is weird, smart, and unbelievably funny. You can read hundreds of Brosh's drawings, doodles, and rants on her blog. Unfortunately, the blog hasn't been updated since 2013. Munroe's What If: Serious Scientific Answers to Absurd Hypothetical Questions is nerd heaven. Think of it as an illustration-heavy and comedy version of Dawkins's The Magic of Reality. Sometimes, Munroe goes too technical that only those knowledgeable about physics, astronomy, computer engineering, robotics and their ilk can understand what he's going into. Other than that, this is a book that can give you the laughs while feeding your brain with information that matters. The final book on the list is How to Lie With Statistics, a book by Darrell Huff that was first published in the mid 1950s. Needless to say, it's a dated tome but Gates says, "It doesn't feel dated. A useful introduction to the use of statistics, and a helpful refresher for anyone who is already well versed in it." You heard the man.